Felicia Leirner was a renowned Polish sculptor from Warsaw who made Brazil his home, dying in Sao Paolo after a lifetime of genius. This museum and sculpture park, 35000 metres square, was dedicated to her works and opened in 1985. 85 of her sculptures are presented here, in five thematic exhibitions, including Figurative, Abstracts, Organic, and Landscape. These mostly cover human forms, animal figures, and fantastical white shapes. These sculptures blend harmoniously into the flowery landscape. 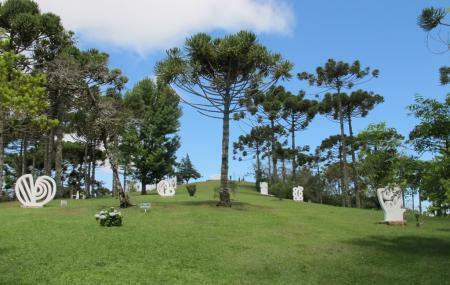 The museum is also famous for the Claudio Santoro Auditorium on site, which is the venue for one of the most important classical music festivals in Latin America, the Festival Internacional de Inverno de Campos do Jordao. The museum has an extensive list of dos and don’ts; check the attraction website. How popular is Museu Felicia Leirner? People normally club together Bondinho Urbano and Boa Vista Palace while planning their visit to Museu Felicia Leirner. Beautiful, calm place. Perfect to get in touch with nature. Very beautiful place! The outdoor museum is relaxing, full of sculptures and nature. You can have a great walk there. The auditorium is marvelous, which a nice background classical music to enhance the experience there. After Inhotim museum this is for me the most beautiful museum I have ever met. The orchestra room is very beautiful. I will plan to go in the winter festival. It is on my list of the most desired.